As part of an op-ed series, FIU News shares the expertise and diverse perspectives of members of the university community. 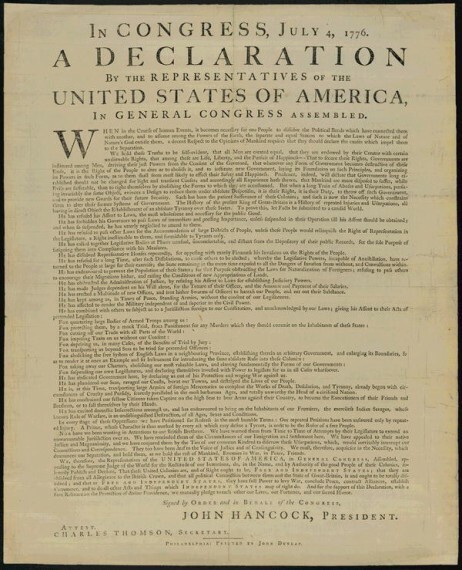 In this piece, Kevin Evans, an assistant professor in the Department of Politics and International Relations who studies the presidency and Congress, discusses the writing and editing of the Declaration of Independence. In the summer of 1776, five men were charged with writing a statement to express the case for independence. The Committee of Five asked Thomas Jefferson of Virginia to undertake the awesome task of writing the first draft of what would later become the Declaration of Independence. Jefferson’s draft was incredibly articulate and powerful. Nonetheless, no first draft is perfect and the text benefited from the input of two other committee members. Both John Adams and Benjamin Franklin offered their input before the work was reported to the whole committee and later passed on to the Congress. Let’s carefully edit our work. Let’s have others read our writing and get their advice. Sometimes we get so close to our writing that we cannot see the areas that need improvement. I am no stranger to poor writing because I often do not give myself the time that I need to produce something spectacular. Writing and rewriting can be tedious, but we can all do a better job of expressing our thoughts, arguments and ideas. Jefferson’s example shows us that good writing and rewriting can actually change the world. So let’s celebrate this Fourth of July by taking that copy of Strunk and White off of the shelf and blowing the dust off! As someone who has taught at FIU for a number of years and has gotten more and more discouraged every semester at the abominable “quality” of writing that I see in my students’ papers…THANK YOU, THANK YOU, A THOUSAND TIMES THANK YOU FOR WRITING THIS!!! I hope FIU students will heed your words. This article is perfect as we head into July. I will join your resolution and be more careful when editing. Thank you for the history lesson and the inspiring words. Yes, there is a lot of bad writing here, on the FIU-North Campus. But maybe, just maybe, if students wouldn’t wait until the eleventh-hour to – start – a paper, we could see a bit of improvement, yes?